You have no time to spare and instead of nice fluffy cupcakes, your baked creation looks like craters on the moon. Don't worry, you can fix them in a jiffy. Whether you overcook them, make them too big or you cupcakes come out cracked, crumbly or sunken in, you can usually fix your baking mistakes in minutes, with just a few simple tools and some extra know-how. Repair cracked or crumbly cupcakes by placing them in the freezer for at least half an hour. Remove the cupcakes a few at a time and cover gently with frosting immediately. Work quickly and do not apply too much pressure. Return the cupcakes to the freezer and allow to re-freeze before finishing if you notice crumbles appearing in your frosting. 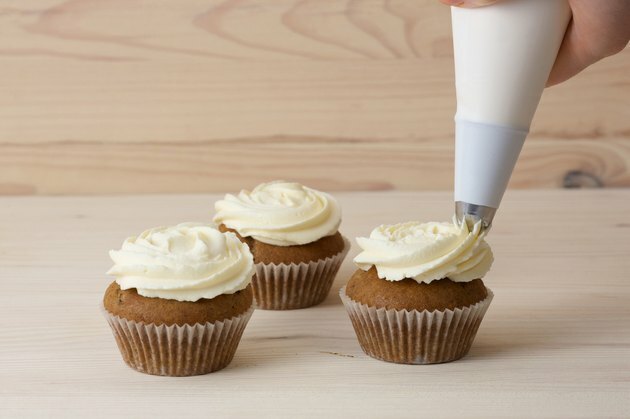 Use additional frosting to fill in sunken spots. You will need approximately 50 percent more frosting than you would normally use to frost your cupcakes. Spread a thin layer of frosting in the well of the sunken area of each cupcake. Allow the frosting to harden for a five to 10 minutes. Place the cupcakes in the refrigerator to speed up the process if necessary. Frost the cupcakes as you normally would after the first layer of frosting has hardened, taking care not to press too hard on the first layer of frosting. Repair burnt or over-sized cupcakes by trimming the burnt parts off the top and edges of the cupcakes. Slice off the over-darkened areas of the cupcakes or trim the edges that hang too far off the sides. Place trimmed cupcakes in the freezer for five to 10 minutes to prevent crumbling and then frost as usual. Avoid cupcakes that sink in the middle the next time you bake by adjusting the leavening agent and flour ratio. Baking soda or baking powder are used in cupcake mixes and recipes to make the cupcakes springy and fluffy. If yours sink, chances are you have too much or too little baking soda or baking powder in your recipe.